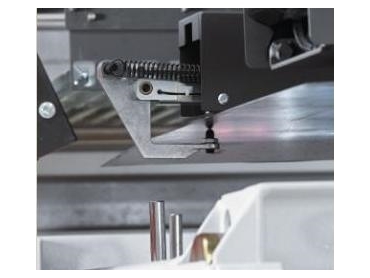 European manufacturers such as Bystronic see safety as a very high priority. The improvements in laser cutting technology keep on coming. Matt McDonald takes a look at the current state of play. Lasers have come a long way and there are more developments on the horizon. At present, the focus is on automation, acceleration, software, higher power, reliability, and stability. Manufacturers Monthly caught up with Dave McHugh and John Douglass from LMC Laser Services to discuss where the industry is right now. Fibre laser cutters caused a big stir when they first arrived on the scene and, as a result, some predicted the quick demise of CO2 cutters. However, CO2 machines still do have their place. According to McHugh, this is because fibre lasers are not the best at cutting carbon steels. If you want to cut thick carbon steel, with only oxygen as the assist gas, you should use a CO2 laser cutter. In addition, because of the different wavelengths involved, a CO2 can cut plastic but a fibre machine can’t. Still, the attractions of fibre laser cutting machines can’t be ignored. “The day will come when fibre will take over CO2. When that day is...your guess is as good as mine, but each year they’re coming out with more powerful fibre lasers,” McHugh said. “The beauty of fibre lasers is they don’t have output couplers or optics or a mirrored beam delivery system such as the CO2. The more mirrors you have in the system the more difficult it becomes. “The fibre lasers are actually bullet proof really. There are lens windows to protect the lenses. The lenses rarely even need to be changed. Safety is a serious issue with fibre lasers. But, according to McHugh, European machines have addressed safety issues very well. “The best thing to happen to lasers over the years is basically software. We call them lights out machines and they are truly lights out machines...,” McHugh said. The machines have an inbuilt failsafe and can be left running at night. If there is a problem of some sort and they can’t keep going, they go into shutdown. The operator presets a shutdown time of, say, 20 minutes. If the machine can’t reset itself after that time, it shuts down. The controller just runs in single phase and no significant amount of electricity, gas, (or money) is wasted. And the machine can email the operators with any problems. Then it is up to them to decide if they want to come in and fix it. But the benefits of automation also extend to day operations. Laser cutting machines can now change their own nozzles, centre the nozzles, handle the heads and so forth. “These days, there isn’t much for the poor old operators to do. They are broom pushers most of the time,” Douglas said. “In the good old days ten years ago the operator had to actually know something about the operation of the machine,” Douglas said. “In Europe now a lot of the so called machine operators are basically just people off the street. They might shake the parts out of a cut sheet, put the scrap in the bin, pile the parts up, and count them. According to McHugh, remote diagnostics have also had a big impact. For example, he said, on a CO2 machine a service technician can now plug in to check the output coupler temperature. If it’s too high he’ll receive a warning. And (also on CO2 machines) lens monitoring can be used to stop the machine before the lens blows up. “These things weren’t dreamed of 25 years ago but now they’re just the norm,” McHugh said. Computer speed and power has made higher acceleration rates possible. Why does acceleration matter? Isn’t it all about speed? Not for all jobs. Some jobs involve a lot of stopping and starting just because some objects have a complicated shape. “If you imagine [manufacturing] something like a saw blade where it’s all stop, start, curves, it’s the machine’s ability to get up to those cutting speeds that matters,” McHugh said. Of course speed is important, but it’s being able to get up to those high cutting speeds in a short amount of time, then stop and get up to speed again, that lets you make a saw blade quickly.